I really liked Sham better than Secretariat, but . . . . .
What I meant was, if Sham and Alydar ran in another year than Red and Affirmed, there would be 13 winners. Because no one beat these 2 in all the TC races except the TC winners. I liked Sham too. He ran his heart out and I felt bad for him. Sham finished last in the Belmont Stakes. He wouldn't have been a TC winner. I think Easy Goer is another overshadowed horse. Like his dad Alydar, he was overshadowed by his arch rival. 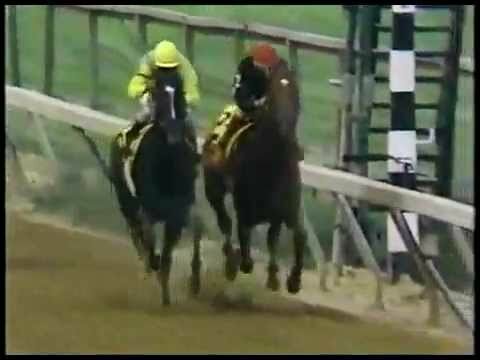 I will always think Easy Goer was better than Sunday Silence. Easy Goer is also really high on my list of great horses. He could have been legendary. SS won 3 out of 4 and was a better sire. I can understand Alydar or Easy Goer being born in the wrong year, but Sham wasn't one of the "Best Racehorses of All Time." I will always love Easy Goer more than Sunday Silence. No changing my mind. And Easy Goer died at 8. He never got a good chance to be a great sire. Not saying Sunday Silence wasn't great, because he was. He was a truly tremendous horse and is one of the greats. Sham didn't finish second in all TC races, he finished last in the Belmont. I'm not hating on him, just trying to get the record straight. This thread is titled "The Best Race Horses of All Time." I feel it's a disservice to many of the greats who gave their all and won so many top races to have Sham listed above them. Easy Goer supporters always have a list of excuses. Nothing wrong with loving one more than the other, but who was best? I think SS proved that. What top races did Sham win? Yeah, darn that pesky holding barn with it's tight security. Sham isn't close to being one of the best. He was good, but horses like Spectacular Bid, Affirmed, Seattle Slew, Dr. Fager, Sunday Silence, Easy Goer, etc would use him as a salty snack. I admire Sham and I wish he had a chance to prove himself, but he simply never had the chance. It's like saying Barbaro would have beaten Bernardini; we will never know. Zenyatta Rules, I have no problem with your list EXCEPT ONE: You placed SHAM 7th place of the males. I don't think he belongs there. You listed Sham ahead of Affirmed, Seattle Slew, Sunday Silence, Alydar, Alysheba, Man O' War, etc. Equivocating love for greatness isn't too rational.